Due to the rainy forecast, the outdoor music will be postponed to a later date. The Village Wine Merchant will host a wine tasting. Dimitry, Sorella, Sea Cliff Hardware, KD Collective are open. Santosha, on Roslyn Ave, will be open until 7. Spread the word and bring friends. Sea Cliff is ready to Warm Up! Chill Out was such a success, we are doing it again. 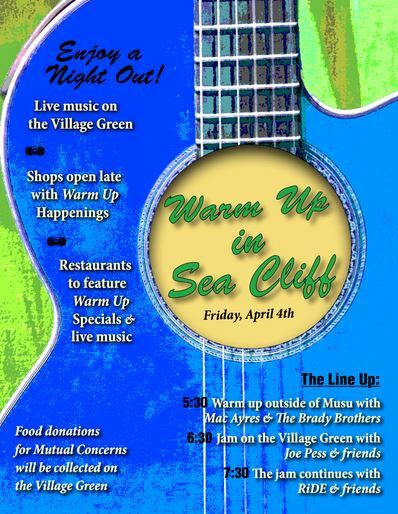 Warm Up in Sea Cliff is Friday, April 4th, 2014. The night begins with live music on the Village Green, in front of Sea Cliff Library. Mac Ayres and the Brady Brothers kick off an evening of music, at 5:30 p.m., in front of Musu. The music continues on the Village Green with Joe Pess and Friends at 6:30 p.m., then RiDE and friends at7:30 p.m.. Shops will be open late with "Warm Up Happenings" and restaurants will feature Warm Up specials and live music. We will be collecting food donations on behalf of Mutual Concerns. Look for the collection boxes on the Village Green. Sea Cliff Youth Council will be serving refreshments. Join us for a night out on the town that celebrates our local businesses and musical talent. Spread the word and bring friends. See you there!